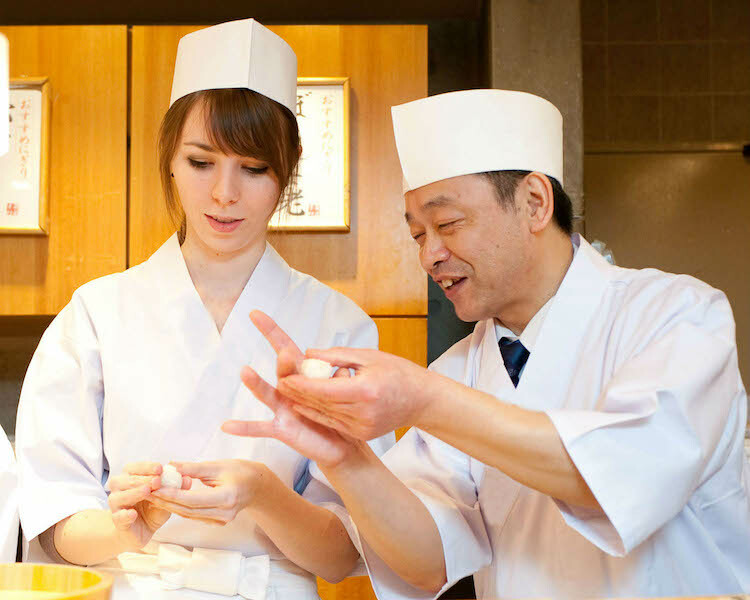 On this private VIP experience you will learn how to make authentic Japanese sushi from a master sushi chef. In this unforgettable lesson you will get the full experience of a sushi chef -- making sushi from behind the sushi counter while wearing a chef's uniform at a famous Tsukiji restaurant which was established over 90 years ago! You will eat your creations for lunch (plus a couple of pieces made by the master chef) while also learning about the history of sushi and secrets of the trade, conveniently translated by a fluent tour guide. You also get to keep your paper chef's uniform and a few other souvenirs from the restaurant to remember your experience! You will be picked up at your hotel and brought to the restaurant. Once you arrive, your private experience will begin by meeting the master chefs and putting on the chef's apron and hat. The chefs who will guide you through the sushi-making process are all masters of their craft who trained diligently for many years before they were allowed to serve customers. You not only get to learn authentic sushi craftsmanship from a master chef, but you will also get the incredibly rare experience of actually stepping behind the sushi counter to make your creations from the point-of-view of a real chef. 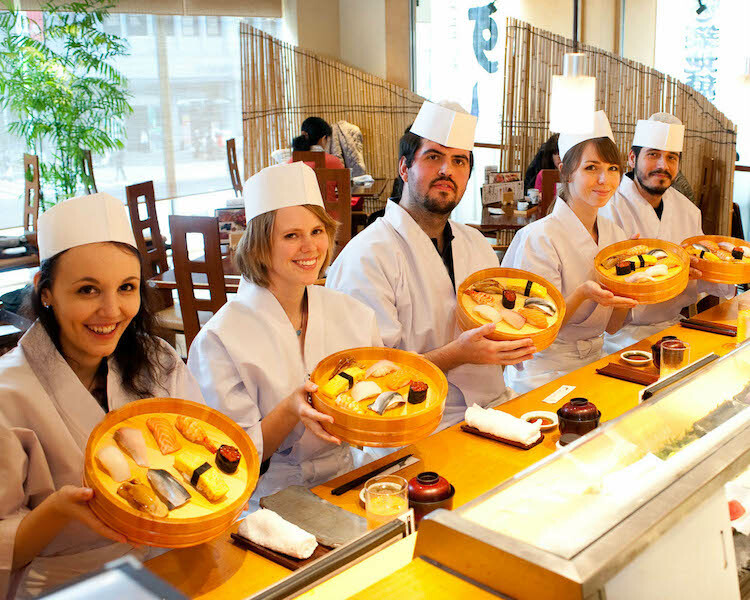 The friendly master chefs will guide you through making a number of different traditional "nigiri" sushi using the freshest of raw fish acquired earlier that day from the nearby Tsukiji fish market. Unlike much of the sushi found abroad, this is "real-deal" authentic sushi from a famous restaurant with almost a century of history behind it. You will finish by choosing one hand-roll to make (avocado, tuna or crab), and then you will move to a table to enjoy your creations, miso soup, and a couple of sushi pieces made by the master chef! 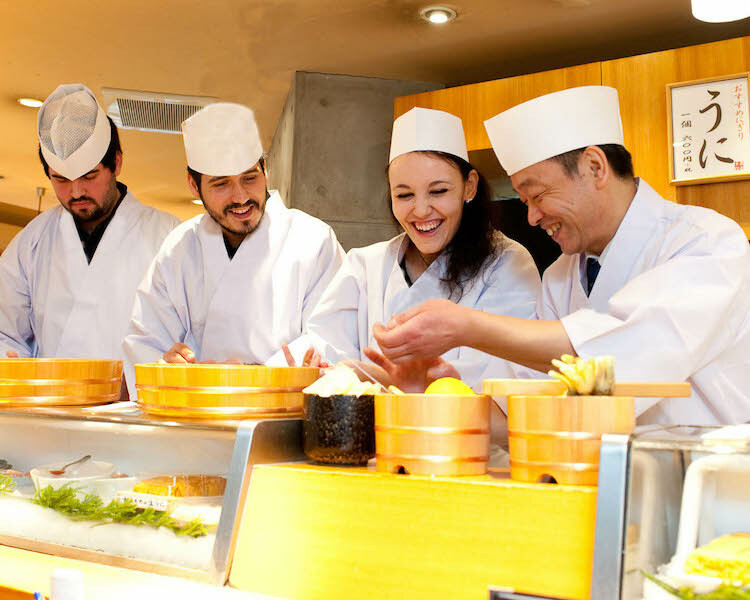 During the meal the chef and your professional tour guide translator will explain to you the history of sushi, secrets of the trade and answer any questions you may have. In addition to the white chef's coat and hat, each of you will receive a fan, a traditional "yunomi" teacup, and a group photo to remember your experience. Note: This is an authentic experience which uses raw seafood. At the time of booking, you MUST notify the tour operator of any food allergies. Operated by an English-speaking guide. For safety reasons, children between the ages of 5 – 7 and very active or inattentive children are not allowed behind the sushi counter. Instead, you will be able to enjoy making sushi in front of the counter where there is more space. We thank you in advance for your understanding.